Order from your mobile device with Online Orders Now! It’s official, more customers are browsing the web with mobile devices than with desktops and laptops. Your online ordering system should be optimized to give those customers the best possible experience. The Online Orders Now online ordering system employs adaptive technology to do just that. We use the latest frameworks to create a mobile-friendly format that is also small screen and bandwidth friendly. 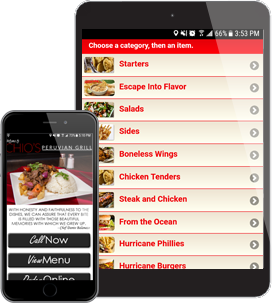 Our mobile ordering app lets customers easily browse your menu and other offerings, which means they are statistically likely to order more food each order. See how your website compares by using our proprietary Web to Mobile comparison tool. It will show you what your website looks like on both desktop computers and mobile devices compared side-by-side. Call us today at 813-549-7010 to speak with one of our sales associates and start setting up your mobile online ordering system today. You can also use the contact form by clicking the button below.